The newest addition to the award-winning, ruggedized Flash Voyager family, the Voyager GT 128 breaks through with a spacious 128GB of storage and blazing speed. Using a unique dual-controller design, the Voyager GT delivers read and write speeds near the limits of the USB bus. 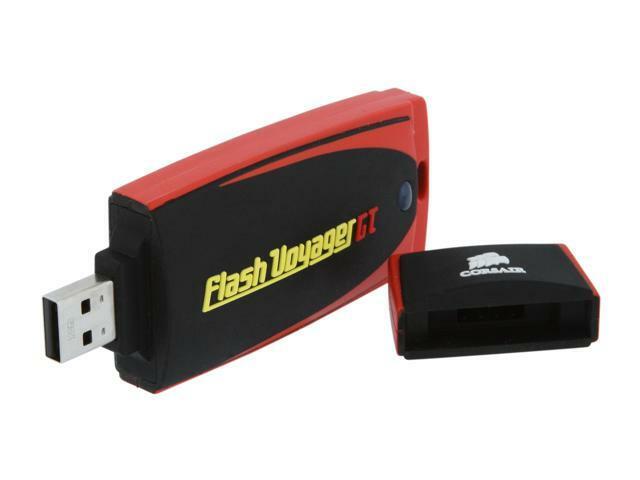 Nearly 75% smaller than a typical portable USB hard disk drive, the Flash Voyager GT 128 is the most convenient way to transport huge amounts of data, including high-resolution photos and artwork, HD video footage, massive databases, or even entire music collections. Fast . On a par with portable USB hard drives, and more than 2.5 times faster than competing high-capacity USB flash drives. Durable . With no moving parts and a ruggedized, rubber housing, the Voyager GT 128 is water-resistant and virtually shockproof to 1500G. Convenient . Just plug it in and go! No special cables, drivers or power adapters needed. Other Thoughts: Yes, it is big. Very big. But consider how much data it holds. It holds more than my little 100gb usb hard drive and it sure as hell is tougher. Speaking of tough, it is coated in rubber and bounces if you drop it. I work as a computer tech and the thought of having 128gb's in my pocket makes me happy. I can fit all sorts of apps, IT tools, documents and even a few movies on it with no worry. Other Thoughts: My 32GB Voyager lasted about 16 months before it went bad. Let's hope this huge thing lasts about the same amount of time or longer.